Hi everyone. Just joined this fantastic forum and already I think I will learn lots here. 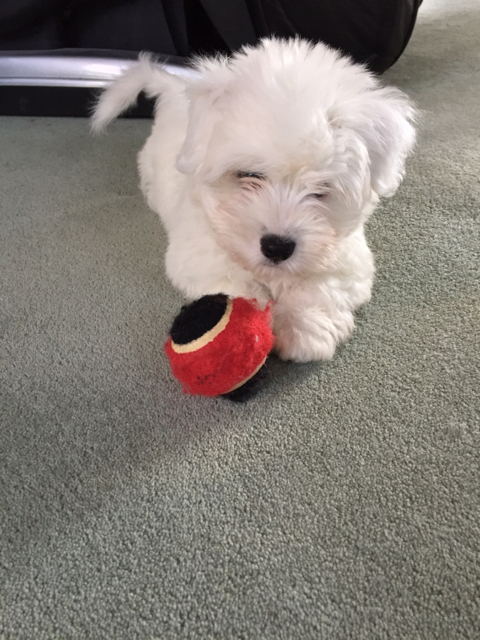 I have a new Coton de Tulear puppy who just turned 3m old and he is absolutely adorable. He is already a massive hit at the school gate so my wife tells me. I will be looking for tips and advice on how best to train and care for him properly and I know it will take patience, as well as how best to manage some of the more individually challenging characters. Hope to contribute some smile, some frustrations and some laughters all in unequal measures. Looked at a picture of your dog breed. Adorable! Hi Flapajack! Welcome! I'm glad you like it here! It would be great if you could post an album! I have two betta fish named Rainbow and Swimmer...they are very good little fishies. You dog breed is sooo cute! Thanks for joining! It's great here! Yes, Linda is right..just ask if you have any questions! even though I do not have a dog(s) I still know a lot about them! Maybe not as much as Alpha or Linda, but I still know a lot. I take care of a dog. In fact, for starter perhaps I can share some going-one and my thoughts and would be interested in the expert masses’ opinions/views - even if it may well just turn out to be academic going forward (hopefully). We have had the little darling coming to our 3rd weeks now. Since we had him, the first 2 nights he slept through reasonably well (between 22:00 and 06:00) which was great. However, for almost the next couple of weeks he has been going 2-3 times every nights, first on the kitchen floor, then inside his crate where we kept the door open - my wife is not keen on the idea of “locking” him in lol. Each time he goes in he made a really big fuss barking and whining calling for attention. What was worst was that he has terrible separation anxiety and whenever being left alone he barks and whines - which makes it quite difficult to get him settled again each time I had to see to him during the night. The breeder whom we got him from advised that we have managed to get him all confused mixing up day and night as he was sleeping well through the night with her. It got so bad that I was thinking of returning him at one stage - especially during one of these many middle of the night occasions where I waited for him to calm down after a barking session. The breeder advised us to be firm with the crate training, and ensure he is crated-in over the following few days to ensure he gets the potty training sorted. What was not helping was that we got him quite confused about what he should be doing by being entirely inconsistent. We initially got him quite a large crate (one that would still suits him when he is fully grown). Then when the breeder advised using something smaller, we got him a smaller crate which is probably still twice the size needed for ”crate training” - which he dislike even more. We first let him roam free around the house, then restricted him to the kitchen and dining room where we have tiles/hard floor and can cope with any accidents. Subsequently we restricted his freedom even further to only the kitchen. Now, however, we have managed to settled on the big crate inside a playpen which we can closed off. In addition, I had to remove the crate door entirely as he was not comfortable going in there with the risk of the door closing. In fact, his crate now resembles more an Arabian tent with blanket draped both the back and front covering his “bed”, with the front only just half-way down so that he can see out and leave as and when he pleases, but still gives the feeling of a relatively secured den. This arrangement seems satisfactory to him as he is now happily to go in and out and have no issue of resting inside when he is bored/tired. His potty training is also coming along nicely and he goes quite regularly when we take him out to the garden. There are still the occasional accidents and so far we have not managed to identify his tell-tale signs yet. However, I am sure we will get there. So as it goes I can’t complain too much, especially now that we are starting to settle down to a good routine and he appears quite content. For a breed that is meant to be only moderately energetic and active, he is actually quite a clown and full off beans - anytime you have time for him he is game! Some real growth opportunities ahead. So any comments/observations about what I could have done differently/better and any advice on how best to get him switched over to nighttime sleeping and daytime pooping rather than the other way rounds? I will give you step by step directions. First the crate has to be small, just big enough for him to stand, turn around and lie down. When he barks or fusses take him out. If he goes potty give him a treat and praise, if he has accidents and he will don't scold, hit or holler at him, this will only make him afraid of you and he'll find corners to go in where you can't see him. Put him on a schedule, feed him a good grain free food, take him out about ten minutes after he eats. He is a baby so should be fed three times a day. Teach him words like "outside" when you take him out say "outside" and when he is outside say "go potty", when he gets it right treat and praise. New food pushes out the old so ten minutes or so take him out, if you have to bring some of his poop outside and put it where you want him to go and say 'go potty", again praise and treat, if he doesn't go put him back in the crate and try again in a few minutes. No food or water at least two hours before you put him to bed. If he cries in the crate and he probably will ignore him. Think of him as a small child, if you give in the next time he knows the more he cries sooner or later you'll give in. You can also put a bell on the door where he can reach and teach him to ring the bell when he wants to go out. After eating, playing or sleeping he will have to go out immediately, if he starts to circle or sniff tell him outside and take him out, praise and treat when he goes. If he doesn't go put him back in the crate. After he goes he can stay out of the crate for a while but closely supervised. when you can't watch him every minute he needs to be in the crate. It sounds harsh but within a month he'll be housebroken. He is a small dog, so if you prefer you can litterbox train him. Using the same method but say "box" instead of outside. Housebreaking is really easy, if you are consistent with him. As far as him sleeping at night, a tired puppy is a good puppy, before bed take him outside and really tire him out, then he'll be ready to sleep. If he wakes up take him out then put him back to bed. Dogs like a routine and the sooner you get him in a routine the easier time you'll have training him. He is just a baby so has a very short attention span, be consistent, if you vary from the routine you will confuse him and have to start all over. he is either housebroken or he isn't, if he goes on the floor he isn't. Don't get comfortable and think he's coming along because he goes a day or two without an accident. A housebroken dog will NOT go on the floor, but you need to realize he can only hold in one hour for every month old he is so take him out often. How late in the evening are you feeding him? When is the last time you take him out to the garden to go potty before bed? When you want him to retire for the night, are you also quiet in the house with lights out and ready for sleep? Do you have a safe area for him to go in the house if needed, like pads or papers? Just asking these questions because some changes may be key to his training. I never let my pups out of the kitchen where they had the newspaper to use unless they were closely supervised, to correct them in the moment if they did start to do something on the rug. They should be picked up, even in mid-stream, and calmly told no....you go here....then put them on the spot you have where it's safe to go. When they're in the next room under supervision, and you start to see them head to the pad, paper or back door, then you know they're learning. I don't blame your wife about the crate, our breeder insisted we use one even though we never did in the past and didn't like the idea. My boy's heart was about to pound out of his chest with intense screaming when he locked him in there, I was making numerous trips in there to calm him down in the middle of the night, only for it to start again when I left the room. I've trained all my dogs over the years, and this was not the usual whining and barking. After a couple of days of torturing him, I decided to just confine him to the kitchen and it was much more peaceful. If he had to potty, it was done on the paper most of the time, then all of the time. Otherwise he was content to sleep near the kitchen table on a soft rug and even the open crate wasn't inviting enough for him to go into to relax, we ended up putting it back in the box and in the garage and haven't taken it out since, that was around 3 years ago. Hello flapajack welcome to the forum! I guess we still have some work to go although it is quite hard getting him crated given he has quite severe separation anxiety.